The Nakameguro area is filled with many great restaurants, including my favorite pizzeria, Seirinkan. 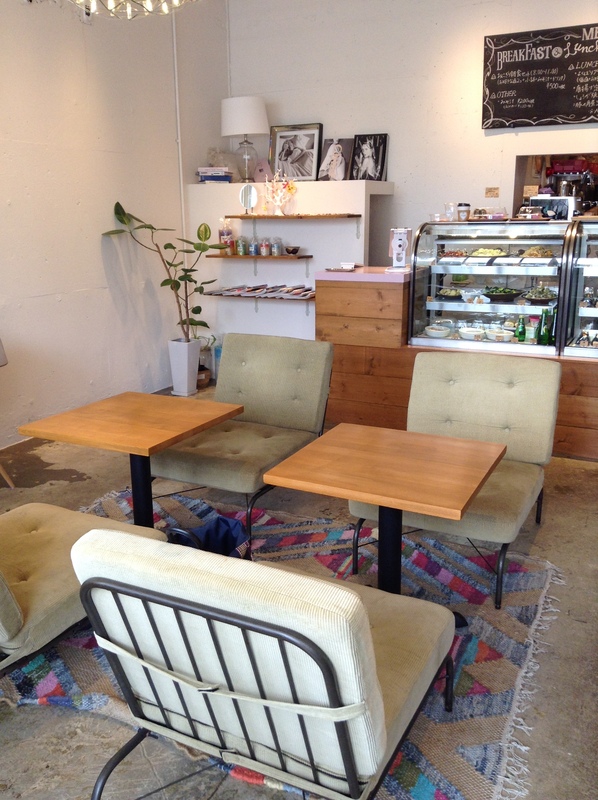 Just a short walk from Nakameguro station is Onigily Cafe. 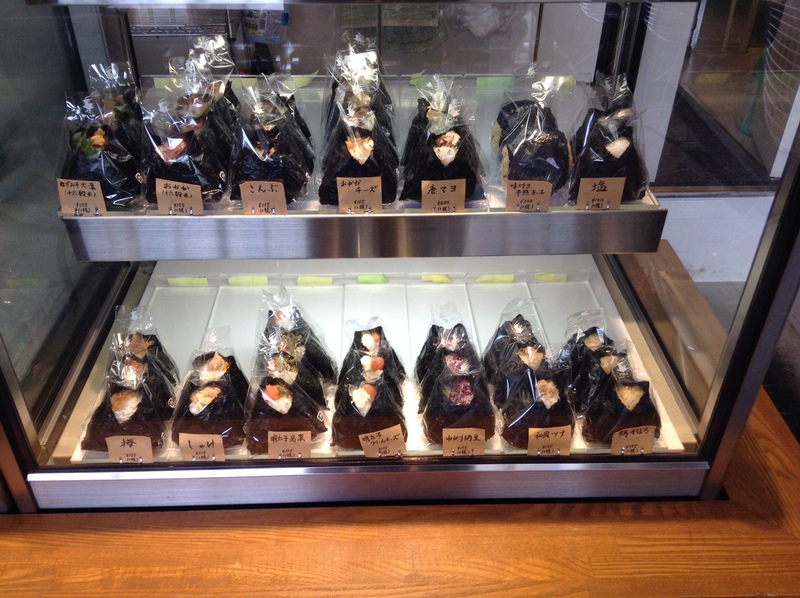 Onigiri is perhaps the quintessential comfort food in Japan. Rice stuffed with a savory filling that is often wrapped with nori. I almost didn’t go in as the spelling of onigiri with an l just seemed so wrong, but it was hot and I needed to take a break. From outside I could see the handmade onigiri and they looked to good to resist. The interior is also inviting as it is brightly lit and there are a handful of tables and a counter at the window. I had the mentaiko and takana, a great combination of spicy pollack roe with pickled greens. The annin dōfu was the best I have had in Tokyo. I will go back just for the almond custard. I was surprised that the onigiri that I was served had just a small piece of nori. But forgot all about that when I bit in. 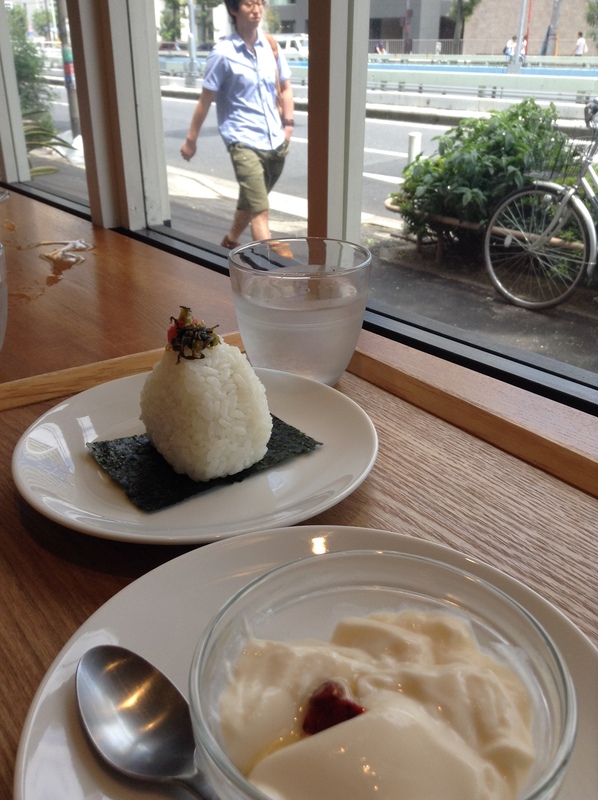 The rice was still warm and was lightly pressed, it was like a pillow. This is a great spot for vegetarians as there is a good selection of vegetable-only onigiri including yukari (salted red shiso) natto, leek miso with shiso, kombu, umeboshi, soft-boiled egg, and salt. There is also a selection of vegetable side dishes including potato salad, tomato salad, pickled cucumbers, and turnips with kombu. It was not surprising that there were many people coming for take-away. The prices range from 100 – 200 JPY with most averaging about 155 JPY, which is about the same as you would pay at a convenience store. But these are just so much better. I have trekked by this cheery cafe & now will stop in. Luv supporting mom & pop shops…and should u be venturing in the opposite direction. Please stop in for this young masters udon. No matter how busy he is behind his open kitchen, he always stops and thanks us. He also expressed his interest in wanting to learn English! Arigato. Thanks for putting this on my radar. I hardly ever make it to this part of Tokyo. It looks very good. Is the chef older or younger? The umeoroshi cold udon sounds lovely. Here’s a cheery snap of him! He’s a young spritely young man! Always smiling and the only chef in the kitchen. Young, indeed. Hope to make it there sooner, rather than later.